(Bloomberg) -- France’s civil aviation safety authority will send three investigators to assist in an Ethiopian-led probe of the probe of the crash of a Boeing Co. 737 Max aircraft earlier this month, the agency said. All analysis will be carried out by Ethiopians at their investigating bureau, a spokesman for France’s Bureau d’Enquetes et d’Analyses said late Wednesday. Bloomberg News reported earlier that the French agency won’t be analyzing the fight-recorder data. Examining the data is the next step after the decoding already carried out at the BEA outside of Paris. 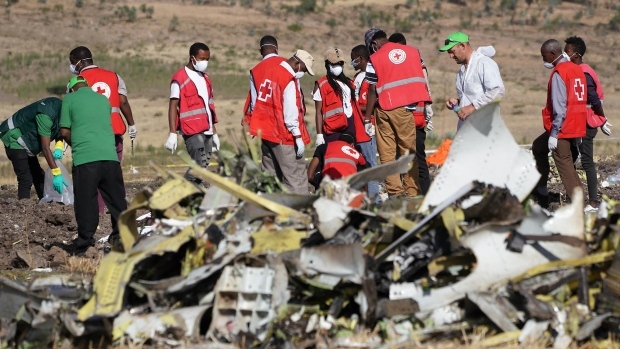 While Ethiopia is leading the investigation, other agencies including the BEA, the U.S. Federal Aviation Authority, the U.S. National Transportation Safety Board, as well as Boeing, have been invited to take part, the BEA spokesman said. BEA will send three investigators to Ethiopia on Thursday afternoon. The voice and data recordings were initially sent to France after Ethiopia refused to hand them to the U.S. Officials in Boeing’s home country had kept the model flying after most other regulators had grounded it, heightening scrutiny on the FAA and raising questions about the certification process for the 737 Max, which debuted less than two years ago. Ethiopian Airlines Flight 302 crashed shortly after takeoff from Addis Ababa on March 10, killing 157 people. The disaster occurred less than five months after another 737 Max operated by Indonesia’s Lion Air plunged into the Java Sea with 189 aboard. Information recovered from the flight-data and cockpit-voice recorders at BEA laboratories led Ethiopia’s transport minister to announce “clear similarities” between the two doomed flights. The raw material was sent back to Ethiopian investigators this week. A spokesman for Ethiopia’s civil aviation authority earlier declined to comment on how the probe will be handled. Ethiopian Airlines had said the initial decision to send the black boxes to Europe was strategic after the FAA was left isolated in the days after the crash, arguing that the Max should continue flying. The U.S. regulator finally grounded the aircraft a week ago amid mounting concern about similarities between the African tragedy and the one in Indonesia, in which a computer system took control of the flight. The NTSB, the FAA and Boeing took part in the technical work done at the BEA. The French agency has handled other fatal air disaster investigations in the past including for Air France Flight 447, which was lost in the Atlantic Ocean in 2009, and Germanwings Flight 9525, which was flown into the mountain in 2015 by its co-pilot. --With assistance from Nizar Manek and Ryan Beene.